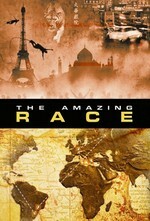 The Amazing Race: "Morroc' and Roll"
The teams race from Copenhagen to Morocco. There are shop stalls to assemble, rugs to hang, an old-style tannery, more fun with bikes, pushing and shoving, petty incidents blown large, lots of getting lost, failure to read the rules, tea, drums, excellent hats, and a U-Turn. Oh, and people aren't happy that the Dentists hit a non-elimination leg and still have their Save. And team rifts are papered over by high finishes and exposed by low ones. Also SOMEONE is going to have to pay for their own honeymoon. The indignity! I think the mother and daughter choose poorly at the U-turn. They went with their emotional desire for revenge instead of the logical play to eliminate the dentists' Save advantage. The surfers continue to impress with their hard work and no complaining. Not to say that they're the only ones, but they seem to stand out in that regard. They went with their emotional desire for revenge instead of the logical play to eliminate the dentists' Save advantage. They did mention that they could see Team Survivor which is probably why they did it. They didn't want to U-Turn the dentists who may have finished the other challenge and crossed the mat already. That's not a bad assumption because if the dentist team had been holding that tray properly they would have been long gone by that point. Then you make an enemy and have nothing to show for it. The surfers continue to impress with their hard work and no complaining. No kidding. The surfers looked genuinely happy for the cyclists despite being maybe 30 seconds away from $10,000. I have had nightmares about tanneries since watching that episode of Dirty Jobs. This episode did nothing to change that. Although wtf, Jim, making fun of my girl Maya and her completely reasonable observation of "this is how they do stuff here." Xenophobic much? As the tan wears off, he's getting more Ugly American. Including not letting the little lady do stuff. Jim the Dentist really does not do not winning well. Yeesh. He doesn't seem to find any enjoyment or enlightenment in the race except when it's reinforcing his own self image (winner). I think the surfers are a strong candidate to win it all - they read instructions, they think about the tasks, they're strong, they're adaptable, they don't bicker. The cyclists are my other strong candidates at this point. They've snapped into a groove in the race. I do think there's an advantage in (trying) to U turn the dentists at this point - you can spin it as "I knew it wouldn't make you go home since you have the save, so we all could keep racing. " or "I just wanted to even playing field. That save is pretty powerful, and as a strong competitor, you can see why I'd want to be on the same plane." Neither'd have worked with Jim, of course, who would get petulent and blame his wife, but that's what I would have done. I'm actually a little sad the dentists are doing better....because there's a full Colin & Christie meltdown inside them, and they're not getting up high enough to fall far enough. Here's hoping though. I'll give the mom/daughter a pass on not u-turning the dentists, because they didn't know if they were already through it and they wanted to u-turn somebody. What I don't understand is all of the other "we choose not to u-turn anyone" people. I mean, nice is nice and all, but the dentists have a frickin' save! Don't you want to get rid of that thing? I really like the bike messengers. And the surfers. The four of them seem to be genuinely decent people, with good heads on their shoulders and values and stuff. I was worried that the female surfer story line would be all about how she can't do things with only one arm, but she just does all the things. And I loved last week when the actually eco-conscious in real life bike messengers won the eco-conscious car in the eco-conscious challenge. Both teams seem really good at not panicking and not getting frustrated and at doing things right the first time. I hope one of them wins. Well, I would. And if I were going to be on Survivor, I'd practice making fire in my backyard with stones and wet straw. But well prepared people who handle stress well, don't really make compelling reality television. I'm really enjoying that the surfer couple aren't hammering the nail of her only having one arm. You know, like Luke who constantly whined about how marginalized he was as a Deaf Guy. Dude, it was your off-putting personality that marginalized you. Being deaf is just a disability. I like watching teams that work together and who take the time to consider which task best suits them. Also reading the clue and not flaunting hubris is a good plan. What I don't understand is all of the other "we choose not to u-turn anyone" people. I mean, nice is nice and all, but the dentists have a frickin' save! Don't you want to get rid of that thing? I think it's a terrible game move to U-Turn them. If the dentists use the save, then there is one less non-elimination leg later on in the race. That might be the leg of the race you come in last. So you essentially send yourself home for no good reason. You also make them an enemy when there is still another U-Turn coming up that you wouldn't be able to participate in because you only get to U-Turn once per season. Letting the Survivors be the only ones U-Turned means they're gone almost for sure. If they somehow stay, they're mad at the mother/daughter team and not you. It also means there are still two non-elimination legs in the race when you might need one of them. It also means you can still use the U-Turn next time when you might really need it. I'm sorry if that was too lecture-y. I was trying to work out the consequences of forcing out the Save and the list of pros and cons was mostly for myself. As a viewer, I kind of wanted them to force the save use out of a sense of justice. It does seem unfair that one team has far fewer consequences if they screw up. A lot of people also want Jim gone before he bursts a blood vessel and his intense eyeballs coming flying through the TV screen. But it was probably better for the other teams to keep the dentists and actually send a team home. Gary, are we sure the Save works that way? I mean, if it just creates a non-elimination leg, then they have to have a Speed Bump on every leg ready--and the cost of unused tasks was part of the reason the Fast Forward on every leg went away. I thought the Save would just lead to an "extra team" racing at times--and maybe a double elimination leg at some point--but the on-screen explanation has not been forthcoming. No, they haven't explained how it works very well. My assumption was that you were not eliminated but wouldn't get a speed bump either. But they would have to cancel a future non-elimination leg in order to balance the number of teams. So the only wasted challenge would be the one speed bump they wouldn't use if a leg had to go from non-elimination to elimination. Them being saved causing a double elimination later on would change things. I wonder if they'll even tell us how it works if it doesn't get used. I think I was assuming (for absolutely no given reason) that the save would be like an immunity idol on Survivor. So, if the dentists played it, the next-to-last team would go home. But I guess there's really no reason to think that might be how it works.